Shore Bancshares, Inc. is the largest independent financial holding company headquartered in Easton, Maryland that offers banking and investment services to families and businesses in the Mid-Atlantic region. Our full-service community bank, Shore United Bank, serves a broad geographic area with 21 full service branches in Maryland, Delaware and Virginia. Wye Financial & Trust, a division of Shore United Bank, offers our clients high quality trust and wealth management services. We care. We care about people and we care about your success. Our company is built around the character of our people and our communities. We are a company built on integrity, dedicated to our clients, our employees, our communities and our shareholders. We care about our employees. We value their dedication and are committed to providing opportunities for them to develop and succeed to their full potential. We care about our clients and our communities. We value the relationships we’ve earned by being trusted advisors and providers of financial services over the past 100 + years. We are committed to continuing that legacy, to building long term relationships and to providing exceptional service. We care about our shareholders. We value their trust in us and we’re committed to providing them a return on their investment. Our clients will not want for service. We are engaged in relationships with our clients bringing value to every interaction. We focus on strengthening the relationship, creating security and stability. Our employees will not want for opportunities. We provide an inspiring environment with passion, respect and collaboration. We provide our employees with opportunities for growth. Our community will not want for our involvement. We have a responsibility to use our talent, skills and resources to create positive impact. We are actively engaged, and continuously look for opportunities to support our communities and improve people's lives. Our shareholders will not want for a return. We constantly strive to deliver on our commitment to create value. We operate our business in a manner aligned with creating and preserving wealth. 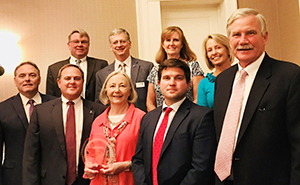 In 2018, we were honored to be named Talbot County Chamber of Commerce's Large Business of the Year! Looking for more information about Shore Bancshares?